With the Discover Murray River Passport in your pocket you’ll unlock the best experiences and secrets along the entire length of Australia’s great river. Available as limited edition 2014 printed booklet, the 144 page, A5 Passport/Guide includes attractions, clubs & pubs, river information, history and much more. It also includes special offers from participating businesses so you can get the best value from the region across Victoria, New South Wales and South Australia. With maps, town information and lists of things to see and do along every part of the river, it’s the essential travelling companion for any Murray River holiday. For those who love social media, you can share your journey with #DiscoverMurray. Your Passport will also take you off the beaten track and into the local towns and of course you’ll criss-cross the mighty Murray River the whole time. With 25 main towns, 10 major National Parks and a 1400 kilometre driving experience, you’ll discover our ‘one river, many lands’ as the river’s landscape changes and unfolds around you. Experience the Discover Murray River Trail’s five different landscapes. From the Mountains, Steep Banks and River Gums, Mallee and Outback, Golden Limestone Cliffs and Plains, Lakes and Coorong as part of very popular great Australian river drive. 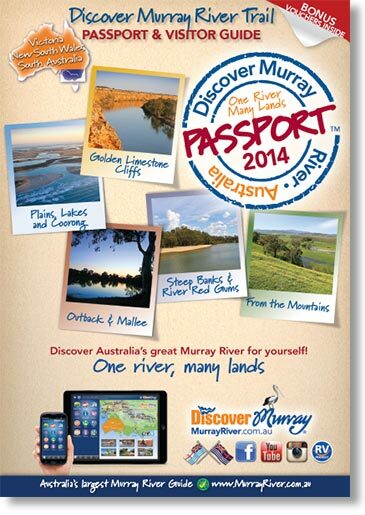 Unfortunately the Murray River App is no longer available with this printed guide. Since 1998 the world’s largest Murray River website (www.murrayriver.com.au) has actively promoted houseboating, cruises, tourism and travel experiences and now we’d love you to discover more of our great river. So tick off the Discover Murray River Trail on your bucket list and let us take you on a special self guided journey of Australia’s great river full of intrigue and adventure..you’re now on river time!